Tongan Blogger Samiuela Taufa gives his views of the Tongan Democracy Movement on Nomoa. Demolition Movement people out there seem to have your wires crossed all wrong. Just seen an interview with Finau Tutone "Pro Democracy Leader" and he said that the fault of the riots was the "King and Government of Tonga." For too many years Tongans have taken things quietly, but now they are enlightened. There you go, if you'd even contemplated some remorse from the Pro Democracy team on what they have recently achieved, then you better just not hold your breath. Let's just put a recap of what the Pro Democracy team have achieved through their riot. Significant parts of government no longer exist or seriously derailed from working (i.e. if you have no office, no records, no files, no desks, then it is pretty hard to do what you were supposed to have done today.) The set back may take days, but some of the resources can never be recovered. Significant unemployment with the thrown around 80% of downtown destroyed. I wonder what percentage of the employed were working downtown ? A large number of the small business' cannot come back from the destruction as they cannot meet the loan repayments owed to the banks, and may likely lose more personal assets. The foundation for economic recovery (private enterprise, small business) has in one fell swoop been wiped out. Not only have the small business' been destroyed but much of the clientele (Business to Business) economy has been wiped out as well. Potential significant price increases in food and general goods due to above shortage. We know for a fact that 'Ofa Simiki has no problems in manipulating the prices up in past shortages, so it will be a change in her not to do so again. And if you get it on the cheap, who says you aren't going to jack the price up and resell it? Fear for Property now exists for Tongans. Fear for Life now exists for Tongans. For all the corruption and screw-ups of the current organisation, administration, you've got to agree that at least the above points were not a serious consideration. Heck, a lot of people are now voting wth their money with the new world order of the Pro Democracies by leaving the country, that's always a great footnote. I hear a lot of bluster from supporters of "Pro Democracy" that this is the repurcussions of years of oppression. My take is? get a life and get an updated text-book. I've spent the past ten years in Tonga in various parts of the community and economy and the only oppression I saw were those self-inflicted by delusional know-it-alls thinking they were God's gift to mankind (while on the other side they're riding the system to screw as many people on their way up.) The only hou'eiki people I "knew" in Tonga I didn't get along with nor liked so they didn't ask me any favours and I didn't give them any. Did I see the corruption ? No more than I'm seeing everyday here in Sydney, Australia. And I saw even more at a time a certain Pro Democracy campaigner was part of the government. 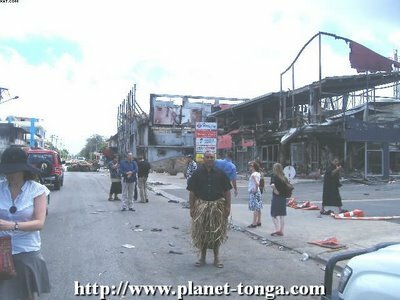 Rally together people of Tonga and best wishes to everyone. So you are saying that Shoreline does not have a backup of its billing system and thefore chooses not to generate power since its certain that it cannot recoup revenues from its customers? C'mon, now! Shoreline is the IT and Communications Centre for Tonga. Of course they have a backup of all their data. Its located at the N.O.C behind the Kings palace. So they can generate power if they want to...but they choose not to because they are concerned that people will not pay their bills. So in effect, Shoreline is deliberatley with-holding an essential service! I thought they would have learned by now! Obviously not! prices have probably gone up because the currency has dropped, the pro-democratic backers i dont believe should be held responsible for the riot, i think the government should be held responsible for all the crimes they have committed first.